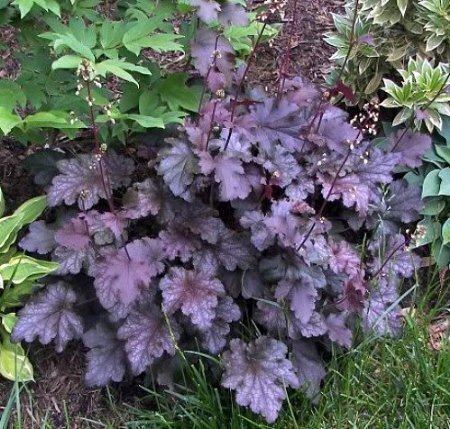 Glossy leaves are maroon-purple when young, aging to bronze-green with bright purple undersides Deer resistant Hardy Zones 4-9, Shade or morning sun Height: 16&quot; Spread: 32&quot; The plant you will receive is growing in a 3.5 inch pot. Visions of dark grey waves smashing into the seashore evoked the name of this heuchera. The magnificently ruffled, somewhat glossy leaves are maroon-purple when young, aging to bronze-green with bright purple undersides. Cream colored flowers appear on 3 foot tall, dark purple scapes from late spring to early summer. &#39;Stormy Seas&#39; has a fantastic compact habit and displays extreme vigor. It is considered to be one of the best landscape heucheras by its breeder, Terra Nova Nurseries. Coral bells are easy to grow and blend easily with most other perennials in the landscape. Because of their low, mounding habit, they are often used as edging along paths or in containers.